From 2.2 to 250 kW, with belt or direct transmission, fix or variable speed. From 2.2 to 22 kW (3-30 HP), fix or variable speed. 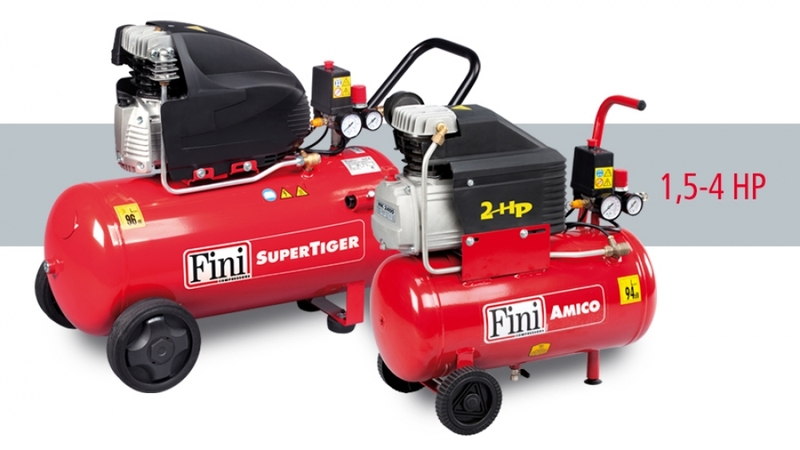 Pneumatic tools and accessories, compressors for decoration. Air dryers, air filters, air-oil separators and condensate drain, vertical tanks, energy saving, heat recovery systems. 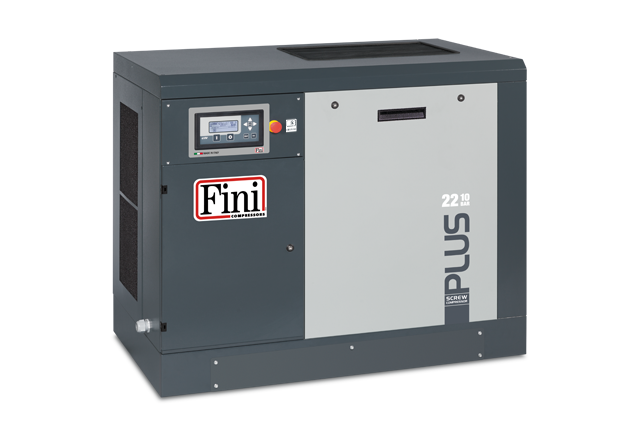 Synonymous with quality, durability and reliability, FINI does not just have one of the most complete ranges of air compressors, but it is, most of all, a standard-setting firm on the industrial compressed air landscape. Oil injection rotary screw compressors, easy to use, with belt transmission and power values from 2.2 to 5.5 kW. Coaxial rotary screw compressors without gears: all the power of the electric motor is transferred to the screw unit featuring top efficiency levels and operating reliability. 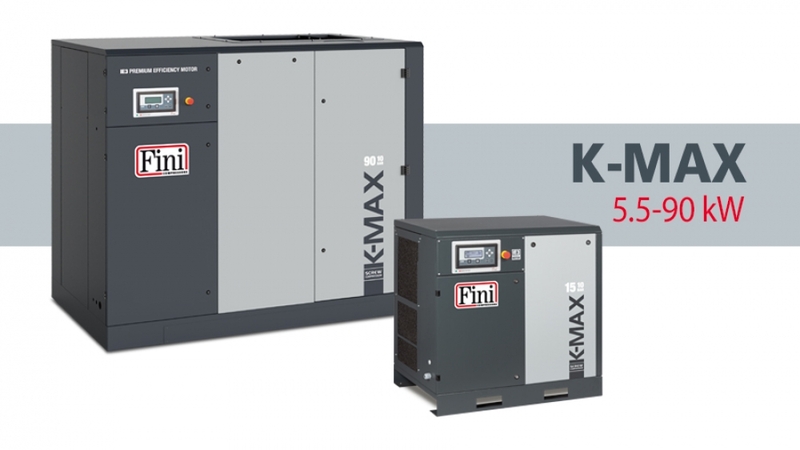 Ongoing investment in technical and product innovation has led Fini to boost its industrial product offer with the introduction of the new K-MAX range. 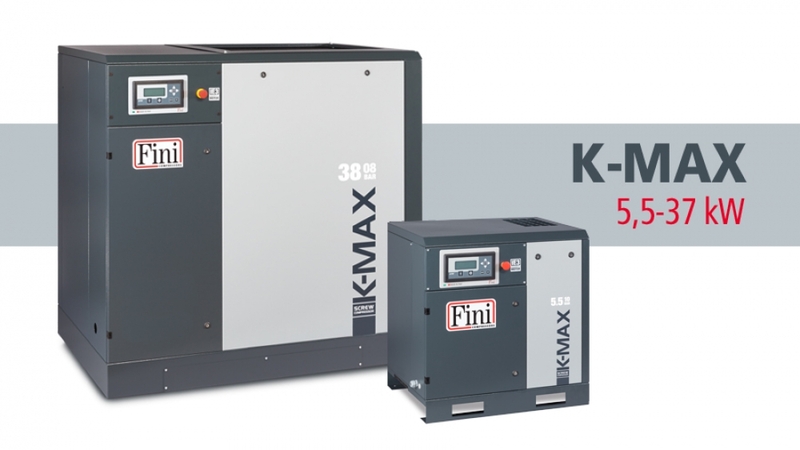 Ongoing investment in technical and product innovation has led Fini to boost its product offer in the industrial sector with the introduction of the new K-MAX range. 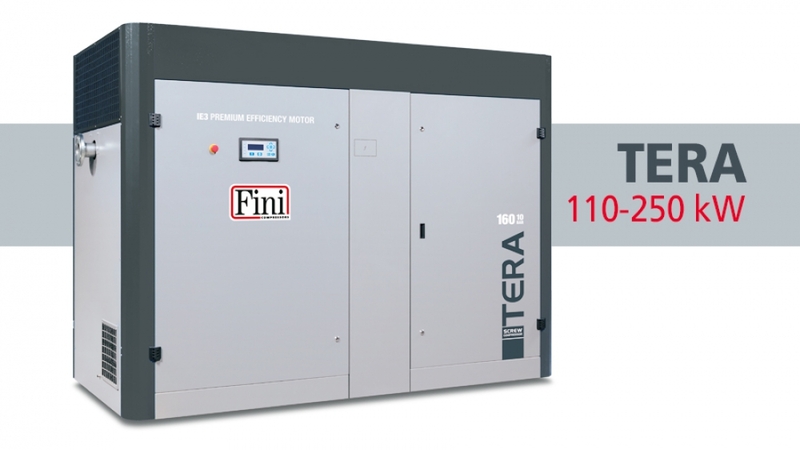 The TERA SD lubricated rotary screw compressors with direct transmission, featuring power values from 75 to 250 kW, are the ideal solution for the compressed air needs of the today' industry. SCROLL spiral oil-free rotary technology and a nominal power value from 2.2 up to 22 kW. 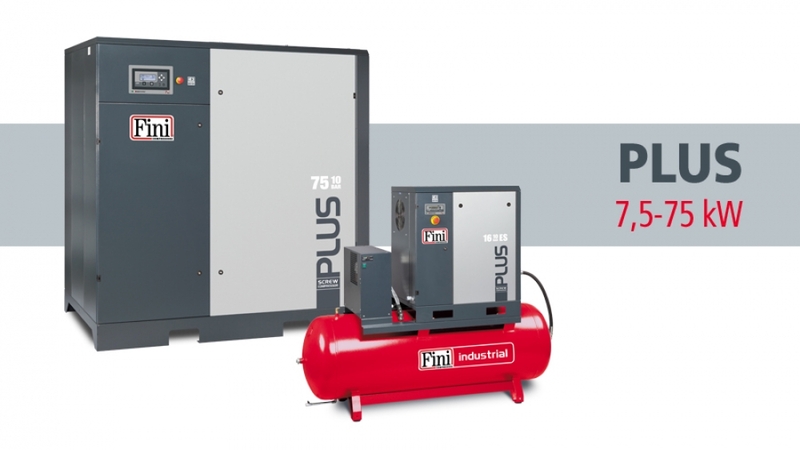 The “SPECIAL” range consists of compressors designed and made to provide air to all those applications, such as for instance the construction industry. 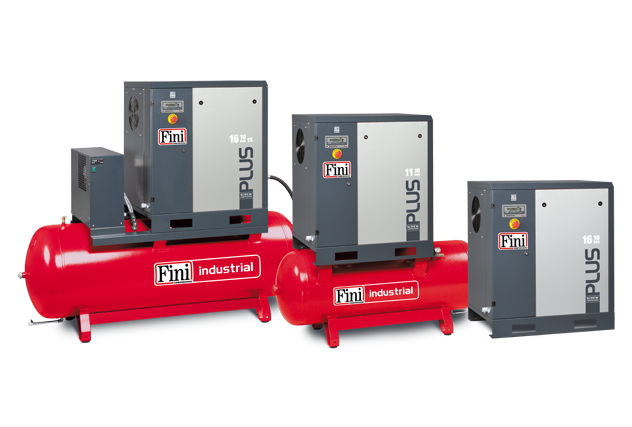 Our range of “ADVANCED” belt-driven compressors is designed for artisans and small/medium-sized industries. Oil injection rotary screw compressors, easy to use, with belt transmission and power values from 2.2 to 5.5 kW. Available with various set-ups, with direct or star-delta starter and “Premium Efficiency” IE3 electric motors. All models are fitted with a phase sequence relay that prevents changes in the direction of rotation of the screw unit that may cause damage. Available power values: 2.2, 3 and 4 kW. Versions: floor-mounted, tank-mounted, with or without dryer. Also available in the single-phase version. “Premium Efficiency” IE3 electric motor (excluding the single-phase version). Available power values: 4 and 5.5 kW. 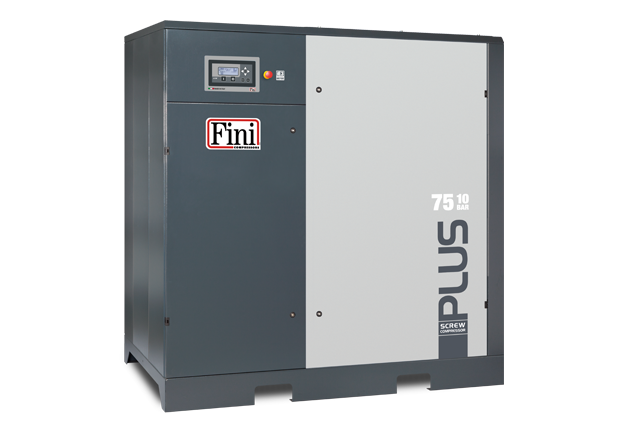 Oil injection rotary screw compressors, with belt transmission and power values from 7.5 to 75 kW. 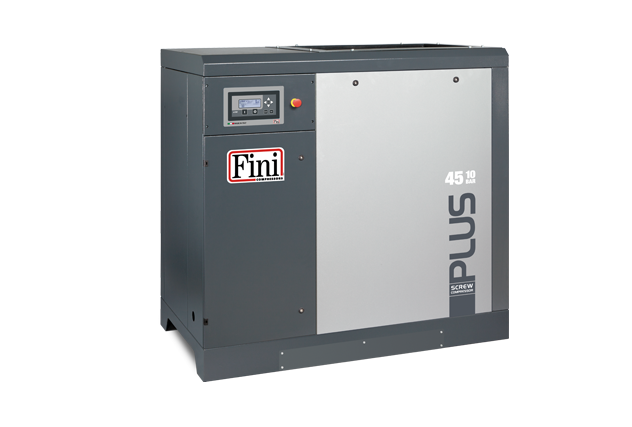 Available with various set-ups, these high-efficiency compressors are extremely quiet thanks to the low rotating speed of the pumping unit and their “Premium Efficiency” IE3 motors. Machines with power values starting from 18.5 kW, featuring the ETIV electronic controller, can be fitted with the SMS remote control system for the compressor via the internet. Available power values: 7.5, 11 and 15 kW. Available power values: 18.5 and 22 kW. Versions: floor-mounted, with or without dryer. PLUS 22, also available in a variable speed version. Available power values: 30 and 37 kW. 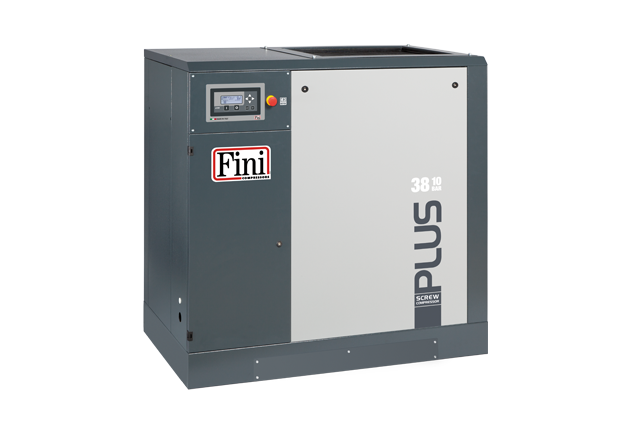 PLUS 38 also available in a variable speed version. Available power values: 45 and 55 kW. Only available in the floor-mounted version. Available power values: 55 and 75 kW. Also available in the variable speed version. Coaxial rotary screw compressors without gears: all the power of the electric motor is transferred to the screw unit featuring top efficiency levels and operating reliability. 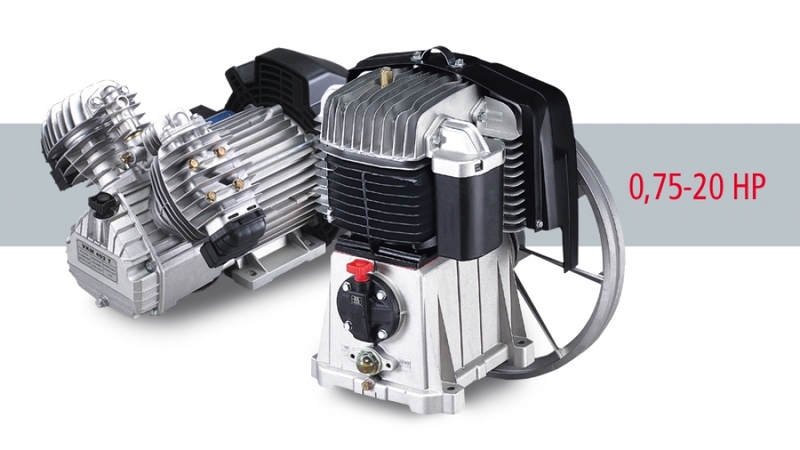 The small size of the air-end/motor connection system allows for an extremely compact design for the compressor. It also means that the air dryer (optional) can be fitted inside the machine without affecting its overall dimensions. 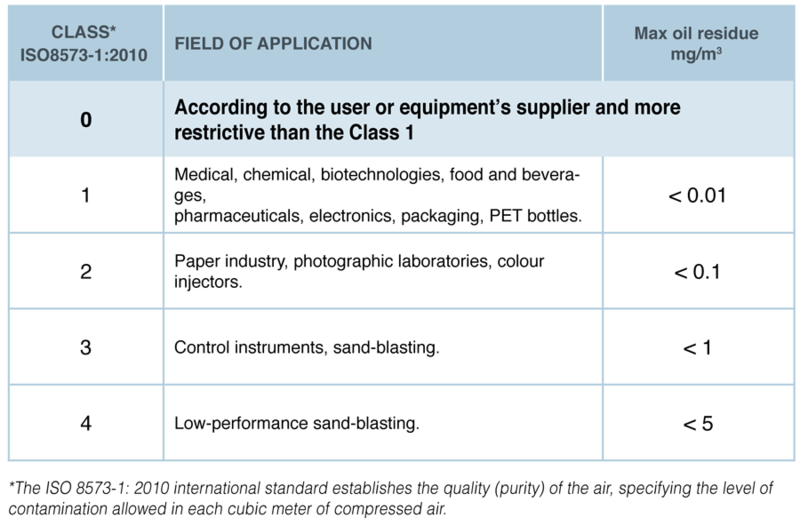 Noise levels ranging from 63 to 68 dB(A). Available power values: 4, 5.5 and 7.5 kW. Versions: floor or tank-mounted, tank-mounted with a dryer. With an extremely compact design, featuring 7.5, 10 and 13 bar operating pressure values, they are all available in variable speed versiona with an inverter (STC series), for all power values. The machine comes with an electronic controller, final cooler, condensate separator with a timer-operated condensate drain. Available power values: 75, 90, 110, 132, 160, 200 and 250 kW. Versions: fixed or variable speed. “Premium Efficiency” IE3 electric motor (IE2 in the variable speed versions). Internal components easily accessible for routine maintenance. These are just some of the endless applications of this technology. This range also includes variable-speed Multi-Scroll models that can be fitted with a built-in dryer. 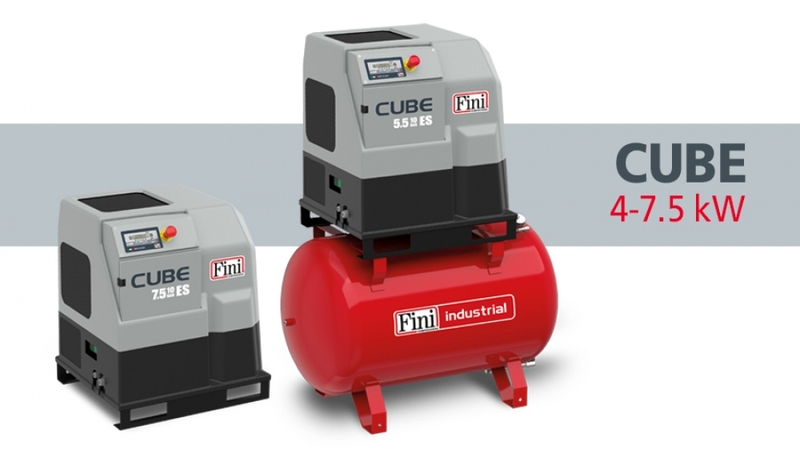 The “SPECIAL” range consists of compressors designed and made to provide air to all those applications, such as for instance the construction industry, that require products that are easy to carry, quit, reliable and sturdy. 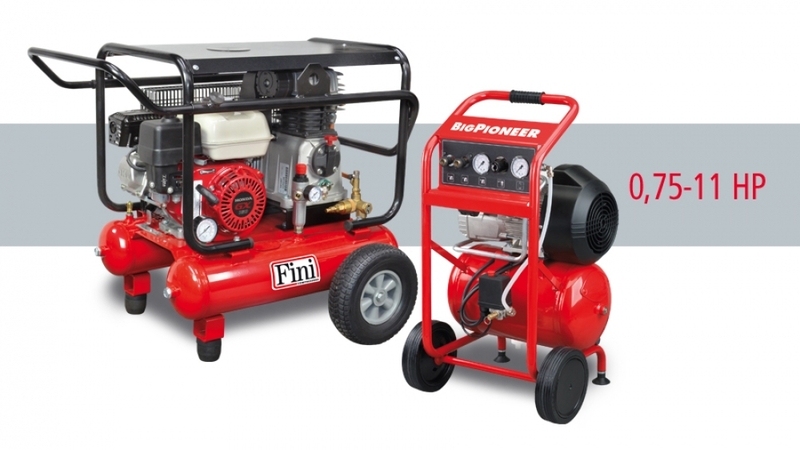 It includes lubricated and oil-free models, with power values from 0.75 to 11 HP, also with pressure values up to 30 bar, tanks from 2.4 to 500 litres and electric and endothermic motors, where HONDA® motors are employed. 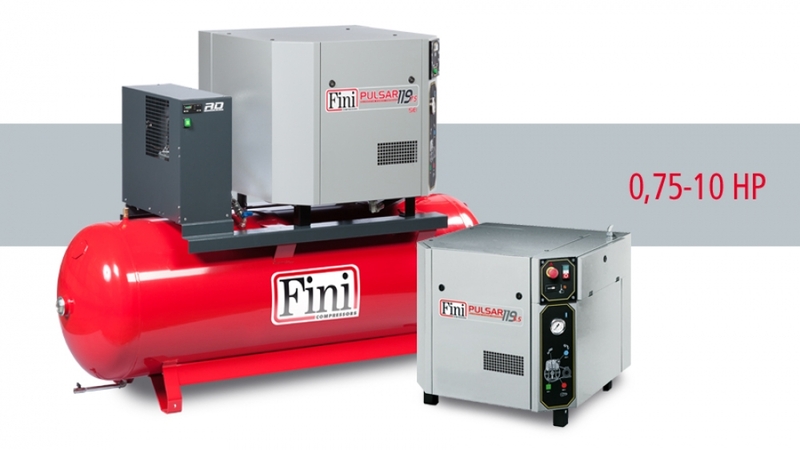 Our range of “ADVANCED” belt-driven compressors is designed for artisans and small/medium-sized industries, where the quality of air, durability and efficiency are essential requirements for daily use. 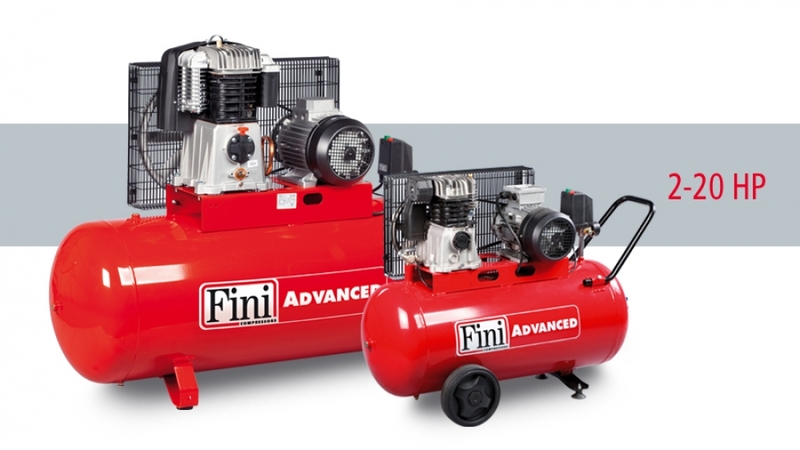 With the large displacement of the pumping units, the low rpm value, sturdiness of the set-up, lack of vibrations, this is one of the flagship lines of the whole Fini's piston range. 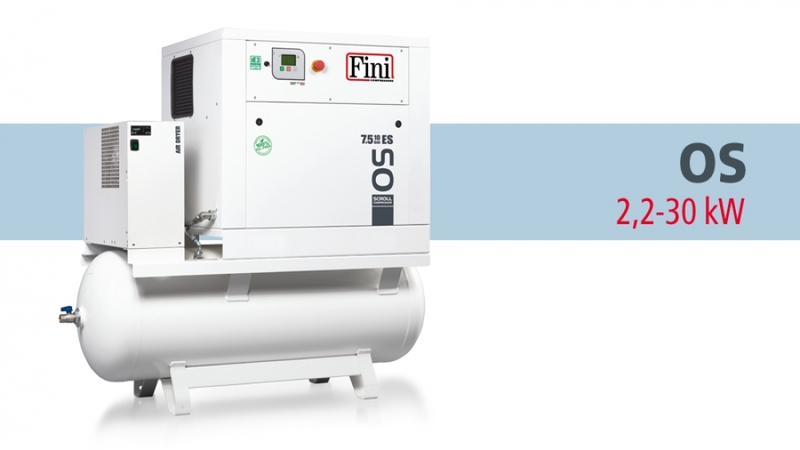 Available on tanks from 25 to 900 litres, with power values from 2 to 20 HP. The ADVANCED line consists of single and double-stage products. Electric motor overload protection with manual reset. Aluminium intermediate manifold between low and high pressure values, high-efficiency valve plate to ensure premium performance. "BKV" versions with V-shaped cast iron cylinder. "BKT Tandem" with 2 dual-cylinder pumping units. Also available on models with a 270-litre vertical tank.